"So to the indifferent inquirer who asks why Memorial Day is still kept up we may answer, it celebrates and solemnly reaffirms from year to year a national act of enthusiasm and faith. It embodies in the most impressive form our belief that to act with enthusiasm and faith is the condition of acting greatly. To fight out a war, you must believe something and want something with all your might. So must you do to carry anything else to an end worth reaching." – Oliver Wendell Holmes, Jr. at an address delivered for Memorial Day, May 30, 1884, at Keene, NH. Each year, on the last Monday in May, our nation celebrates Memorial Day. For many, this day carries no special meaning except perhaps an extra day off from work, a beach barbecue, the start of the summer travel season, or for merchants, the opportunity to hold their annual Memorial Day Weekend sales. In reality, the holiday is observed in honor of our nation's armed service personnel who were killed in wartime. The custom of honoring the graves of the war dead began prior to the end of the Civil War, but the national Memorial Day holiday (or "Decoration Day," as it was originally named) was first observed on May 30, 1868, on the order of General John Alexander Logan for the purpose of decorating the graves of the American Civil War dead. With the passage of time, Memorial Day was extended to honor all those who died in service to the nation, from the Revolutionary War to the present. It continued to be observed on May 30th until 1971, when most states changed to a newly established federal schedule of holiday observance. Confederate Memorial Day, once a legal holiday in many southern states, is still observed on the fourth Monday in April in Alabama, and the last Monday in April in Mississippi and Georgia. May of 1997 saw the start of what is becoming an American tradition recognized by the President and Members of Congress -- to put the "memorial" back in Memorial Day. The idea of a National Moment of Remembrance was born a year earlier when children touring Lafayette Park in Washington, DC were asked what Memorial Day meant and they responded, "That's the day the pools open!" The "Moment" was initiated by No Greater Love, a Washington, DC-based national humanitarian organization. For the first time in U.S. history, on Memorial Day 1997 "Taps" was played at 3 p.m. in many locations and at events throughout America. This effort was repeated again in subsequent years. The objective of the "Moment" is to raise Americans' awareness of the honorable contributions made by those who died while defending our nation and to encourage all Americans to honor those who died as a result of service to this nation by pausing for one minute at 3:00 p.m. (local time) on Memorial Day. While we choose to celebrate Memorial Day only once a year, there are a number of U.S. national parks that are 365-day-a-year memorials and testaments to Americans killed in battle throughout our nation's history. Among the many national parks that commemorate the American Revolution are places like Minute Man National Historical Park, Cowpens National Battlefield, and Fort Stanwix National Monument. The Civil War is remembered through places like Fort Sumter National Monument, Antietam National Battlefield, and Vicksburg National Military Park. 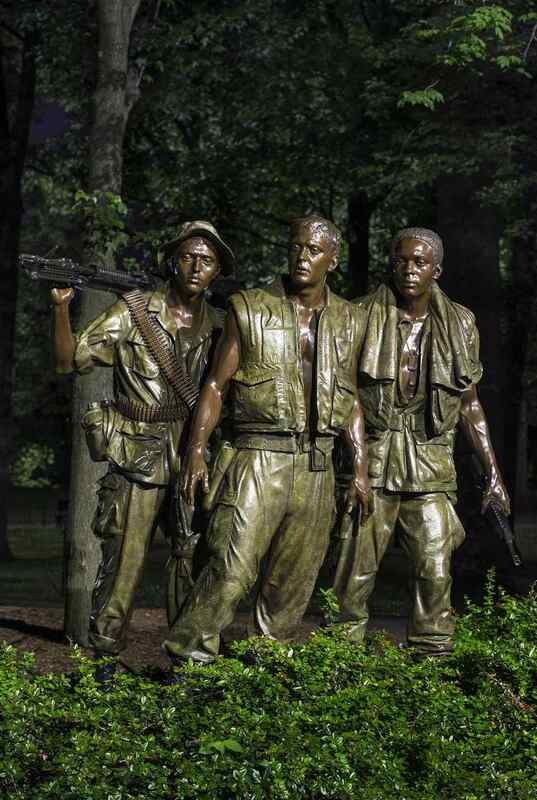 Memorials to more recent wars include the Korean War Veterans Memorial, the Vietnam Veterans Memorial, the Vietnam Women's Memorial, and the National World War II Memorial. Each year at national park sites throughout the country, Memorial Day weekend is traditionally observed with by parades, memorial speeches, reenactments and living history demonstrations, and the decoration of graves with flowers and flags.